Ancient Gods of IndiaReligion had an important place in ancient India. Whether in the Indus Valley civilization or during the Vedic civilization, evidences suggest that in both these periods there was strong presence of religion. The primary information about the religion in the Indus period comes from the objects found in the excavated Harappan sites; the information of the Vedic period comes through the religious texts produced during that period. The objects found from the Indus valley sites indicate that the people believed in some form of animal and nature worship. The figures of deities found in the seals indicate that the Indus valley people worshiped god and goddesses in human form as well. Numerous figurines of females, with a great deal of jewellery have been found from the various Indus sites. There are many terra-cotta statues of Divine Mother that’s being found. These "mother goddesses" appear to be objects of worship for the common people. It’s assumed that Indus people believed in female energy as the source of all creation. The existence of male god a proto-Shiva was also found from the Indus sites. Several of the gods are depicted on the seals that are naked male figure. One of them is with a horned head with a fierce facial expression. In some seals this god is pictured in a crossed-legged posture. The horned god was supposedly favoured by the priests and upper classes. The number of gods and goddesses discovered suggests that fertility was of paramount concern to the Indus people. The obsession with fertility was also reflected in the large quantity of phallic-shaped objects that was found at Indus sites. It was also reinforced through the veneration of sacred animals, especially bulls. It’s assumed that the priests derived impressive control over city and town dwellers during Indus period for their role as the intermediaries between the people and the deities. A bust thought to be of a major priest found gives this impression about the religious beliefs of the Indus people. Indra God There were no less than 3000 gods venerated in Vedic times. Main among them were Indra, Agni (the sacrificial fire), and Soma. 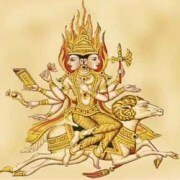 Some gods of social order such as Mitra–Varuna, Aryaman, Bhaga and Amsa also were important. Goddesses included Ushas (the dawn), Prithvi and Aditi (the mother of the Aditya gods or sometimes the cow). Rivers, especially Saraswati, were also considered goddesses. There were nature gods such as Surya (the Sun), Vayu (the wind), Prithivi (the earth). The principal divinity was Indra - the God of War and thunder whose power was capable of destroying the wall of cities of burning them down in order to conquer and pillage them. Soma the ritual drink dedicated to Indra was a prominent deity. Agni was the God of fire, the guardian of the world and giver of eternal life. Surya the Sun God was also deeply venerated. Brahma was the King of Gods. He was the creator or protector who was also given the name of Narayana Prajapati or Pursha. He was the father of all creatures. The other secondary Gods were Arjuna or the God of the dawn and the charioteer of the sun. He was the son of Vinata and the wise Kasyapa. 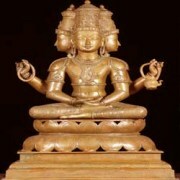 Brahma The Kubera was the God of wealth. Agni Vayu or the God of wind; was the messenger of the gods, the breath of the world, the bringer of life to all beings. People venerated the sun and moon, the latter being considered as a feminine deity, who was both the companion of the sun and the Great Mother of life and the universe. There was some continuity from the Indus period in rituals and worship practice of the mother goddess. This was accompanied by worship of Shiva-the phallic God who was represented by 8 million yonis. In the Rigveda there are 1028 hymns dedicated to specific deities. There is mention 33 deities associated with sky (dyu), earth (prithvi) and the middle realm (antariksha). Yama is the first ancestor was also worshipped as a deity, and the god of the underworld and death Vishnu and Rudra, the prominent deities (Rudra being an early form of Shiva) were present as marginal gods. Many early Vedic gods remained unchanged and through oral tradition their names were passed down to generations. In the later Vedic period some gods who were beneficent spirits were demoted to secondary divinities as wicked and cruel spirits. Some new gods then replaced them. Pushan, who was supposed to look after cattle, came to be regarded as the god to the sudras. AgniThe two outstanding Rig Vedic gods, Indra and Agni, lost their former importance. On the other hand Prajapati, the creator, came to occupy the supreme position in later Vedic period. Rudra, the god of animals, became important in later Vedic times and Vishnu came to be conceived as the preserver and protector of the people. 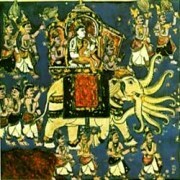 In addition, some symbolic objects began to be worshipped, and signs of idolatry were noticed in the later Vedic period. Some important female deities during the later Vedic period were: Usha (goddess of Dawn), Aditi (Mother of Gods), Prithvi (Earth Goddess), Aryani (Forest Goddess) the Sapta Sindhu and Saraswati (River Goddess). The mode of worship changed considerably during later Vedic period and many rituals came into practice. Prayers continued to be recited, but ceased to be the dominant mode of placating the gods. In its place sacrifices became far more important. The practice of sacrifice assumed importance in both public and domestic sphere. The guests were known as the goghna or one who was fed on cattle. The priests who officiated at sacrifices were regarded generously and given dakshinas or gifts. The Vedic period passed on smoothly to the Hindu period that flourished from 700 to 600BC. With some modifications to the Vedic gods and goddesses, a whole new spirituality developed during the Hindu period. It created a real harmony between mental purification and spiritual solace.